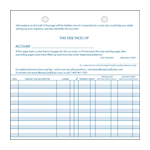 This is a standard general banking register for recording checks, ATM, bank fees, deposits, automatic transactions, and debit card payments linked to a checking account. This register could serve solely as a debit card register, since the only basic difference is that the column for check numbers is deleted from a "pure" debit card register. Our nifty wallet size Debit Card/ATM register (DR-105) fits right into one of the money card sleeves in your wallet for quick easy access to your account information. 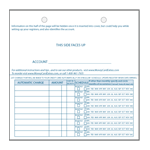 Being of small size there is only a single column for amounts, and the text in the heading of the amount column needs to be mentally expanded to include not only payments and withdrawals but also deposits and running balances (you would need to choose a double-line method in order to update your balances). We are working on a couple of versions that are more suitable, but this is a great little register to keep your debit card transactions and balances at your fingertips in the meantime. 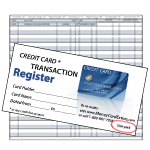 Our looseleaf registers (DR-101) for general banking/debit card have all the same features as this standard check register. 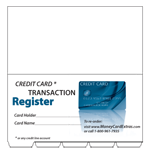 They are designed to be accompanied by our looseleaf credit card registers (CR-103) so that both multiple bank accounts (including debit cards) and multiple credit card accounts can be tracked in the same checkbook cover. However, the looseleaf registers for general banking/debit card accounts (DR-101) can be used alone in your checkbook instead of a standard check register. 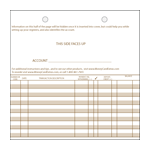 And our looseleaf Automatic Deposit/Automatic Payment Schedule sheets (DR-103), which provide 18 entries per sheet, can replace the Reminder page in this standard check register. 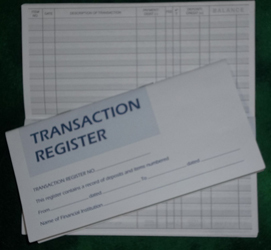 Need to keep account of more savings account transactions than the 14 this register provides? 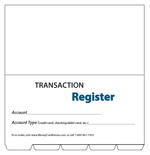 Try our Savings Transaction Record (SV-101), a register booklet that provides for 71 entries.